COLUMBIA, Mo 4/22/15 (Beat Byte) -- Friends and family of a Columbia man paralyzed in a bicycle accident last year have organized a bicycle-ride fundraiser this Sunday to honor him, pay some bills, and pay homage to an important ideal: when you fall off the horse (or bike), get back in the saddle. The accident, which event organizer Teri Covington describes as "devastating," paralyzed John Bowders from the waist down. But that hasn't stopped him -- and his friends -- from riding. "John has no use of his legs and will require a wheelchair and other adaptive equipment for the rest of his life," Covington explains on the group's fundraising page. 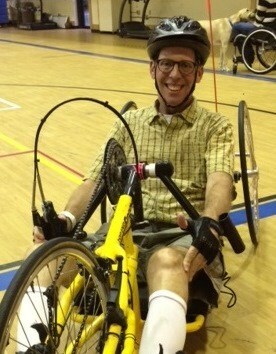 Among the adaptive equipment Bowders is learning to use is a handcycle -- a bicycle driven by hands rather than feet (pictured). He also took delivery this month of a so-called "FES bike" -- a bicycle-type devise that delivers "functional electrical stimulation" (FES) to paralyzed nerves and muscles. "Everyone who knows John knows that being outdoors and active are critical components to his happiness," Covington says. "Most especially, John loves bicycling." Set up through highly-rated non-profit HelpHOPELive, this Sunday's (April 26) fundraising bike ride will be "a great opportunity to support a community member, enjoy mid-Missouri’s lovely bike trails, and have a good time at Katfish Katy’s," explained fellow Old Southwest resident Sandra Gummersheimer. Cyclists will travel through Boone County and parts of Howard County in three ride lengths -- 80 miles, 30 miles, or 15 miles from Katfish Katy’s on the Katy trail to Rocheport and back. Dirt or mountain bikes are preferred, and while online registration ends today, event day registration can be had for a $5 fee. A Mizzou engineering professor, Bowders has great health insurance, Covington explains. But insurance hardly covers every cost, especially after a serious, life-altering event that requires so many important adaptations -- to his car, home, recreational equipment, "and a second wheel chair, necessary if he is to commute to work by handcycle," Covington says. Transportation and family living expenses are also outside most insurance plans. A surgery on his collar bone means a trip back to a rehabilitation hospital, for instance. "Insurance will not pay for his transportation, nor transportation or living expenses for [wife] Patti during this second rehabilitation," Covington says. Patti keeps everyone updated, writing that their many friends have been chipping in, with laundry, driving, and those other small but important chores most of us forget take an incredible feat of human coordination -- hand, eye, brain, legs, feet, arms -- to accomplish. Despite the challenges, Bowders hasn't stopped riding -- or smiling, a standout quality dozens of friends have been acknowledging on his fundraising site. "I could not get over seeing your smile first thing on this page!" Jim Kleppe writes. "Well done, John. You are showing the world how to overcome adversity. Keep smiling!"